Bluesound Generation 2 review | What Hi-Fi? Two things have contributed to Bluesound’s Generation 2 multi-room family - a three-time Product of the Year from the end of last year - to now being a four-star proposition. A price increase in and of itself is not automatically the cause for shift in star-rating but, while a product’s performance doesn’t deteriorate in isolation, the introduction of newer, cheaper and equally talented rivals further down the food chain has brought the Bluesound's value for money into question. Both the Pulse 2 (now £650) and Pulse Flex (now £300) pair up with the Node 2 (now £500) as a means of connecting existing hi-fi to your multi-room network. The Node 2 presents a greater prospect to those wireless links offered by many other multi-room designers: as a streamer it is also, effectively, a source - a functioning cog of your hi-fi system rather than the bolt used to hold it and the cloud together. As such, it has all the ports you would expect on a modern streamer. There are optical/analogue inputs on the same 3.5mm socket, optical and coaxial digital outputs, and USB type-A port too. Bluetooth 4.0 with aptX (for CD-like resolution) is on board, and there’s also a built-in headphone amp and dedicated headphone output. It is capable of playing uncompressed FLAC, ALAC and WAV files up to 24bit/192kHz, as well as other popular formats such as MP3, AAC, WMA and AIFF. If you’ve got it, the likelihood is that the Node 2 can play it. The benefits of the Node 2 as part of a Bluesound set-up are clear, but its feature list, design and build quality should also, in theory, make it a streamer to compete with the big boys in the market. To its credit, the Node 2 has an easy-going tonal balance, each element of the frequency range being kept in line. You can listen to a range of music sources – from low-resolution Spotify streams to hi-res audio files – for hours without tiring. But it isn’t quite able to contend with other streamers in its broad price range. Dynamically, for example, while the Node 2’s handling is steady, the performance isn’t as bold as we’d like. Though it retains the ability to discern loud from soft, overall expression is somewhat inhibited. It’s also not the most rigorous in terms of timing. The Node 2 doesn’t miss beats, but nor does it possess the natural rhythmic sense of other streamers at this price. In terms of detail, the Node 2 skims the notes’ surface but doesn’t provide as much telling insight as we'd like. Reviewed in the context of today's market, the Node 2 is an adequate performer where once it was deemed superlative. But kinder fates await the two wireless speakers in this chosen set. The Pulse 2 demands the bulk of our attention but also leaves us with little new to say. It remains a fine wireless speaker with a skillset which it is difficult to better at the price - even if that price is £50 more than it used to be. It’s a whopper of a speaker, with two 7cm drivers and a 13cm woofer semi-concealed by its grille, each individually amplified with a total of 80 watts of power. Its rear houses optical and analogue inputs for playing digital and legacy sources throughout the house, a dedicated headphone output, a higher-power USB input for powering any hard-drive, and a new wi-fi chipset to ensure a faster, more stable wireless connection. There’s also aptX Bluetooth on board, plus a more powerful ARM 9 processor making library indexing and playback up to 20 per cent faster. In terms of performance, it does everything right. Its presentation offers the kind of power and space expected for its size, with vats of taut low-end – which can be tailored via the app should it becomes too much – but tempers that with an acute awareness of timing, and sympathetic dynamics to portray the expression of a piece as well as its energy and verve. The Pulse 2 is simply comfortable in its quite sizable body, offering the kind of performance that we expect to remain fully competitive for a while yet. As a smaller speaker, however, the Pulse Flex has greater competition. Its own driver array is limited to a 9cm mid/bass woofer and 25mm tweeter, bi-amplified for a total power output of 20 watts, but the scale of its presentation is certainly not where its flaws lie. It shares that Bluesound bent for low-end authority belying its stature. The Flex’s main enemy is not itself but its rivals. With its £30 price hike, it's now head-to-head with the Audio Pro Addon C10. Even taking into consideration their differing footprints, and pitting it instead against the smaller, cheaper Addon C5, the latter comes out on top. The Audio Pro doesn’t trample the Flex, but its superior timing, organisation and dynamic articulation are noticeable in an instant. While the Addon C5 doesn’t offer hi-res music support, its core performance is unarguably better. If we were building a Bluesound system from scratch, though, we would be likely to opt for a combination of Pulse 2 and Pulse Flex rather than incorporate the Pulse Mini. If that sounds harsh, it’s only because the latter’s own price increase (£80 to £500) has taken it a little closer to its Pulse 2 sibling and towards some other very capable competition. Like its big brother, the Pulse Mini is a bi-amplified 2.1 speaker. A 50-watt amplifier drives a 10cm woofer in a dual-port enclosure, while there are two 5cm full-range drivers (each with a dedicated amplifier channel) in their own acoustic chambers. In terms of character, it is still very much in line with its siblings: bold, energetic and surprisingly weighty for its size. The issue is (as with the Flex), as a stand-alone wireless speaker the Pulse Mini is now in competition with the Addon C10, only this time and quite a lot more money. The Bluesound is louder and more powerful but, again, it can’t quite match the Audio Pro’s level of expression or exquisite timing. Audio Pro’s emergence in the multi-room market is a part of why Bluesound has lost a star overall. There are still reasons why you might be prepared to spend a good deal more to buy Bluesound, though. Its hi-res music support will be a big draw for some, and Bluesound’s app is a significant step up over the rather rudimentary Audio Pro offering. With Bluesound, set-up is simple and you’re presented with more streaming services and internet radio sources than you’re ever likely to use. Even the seemingly less important features, such as alarms, will help better integrate multi-room audio into your home life. But if it’s the multi-room user-experience you’re after, Sonos does it even better, with a more cohesive, complete, stylish and slick app. Lack of full Spotify integration (you have to leave the Bluesound app and use Spotify Connect) may increasingly be the norm, but it’s an issue Sonos doesn’t have - and the lack of a proper universal search feature is another blank for Bluesound in the app comparison. 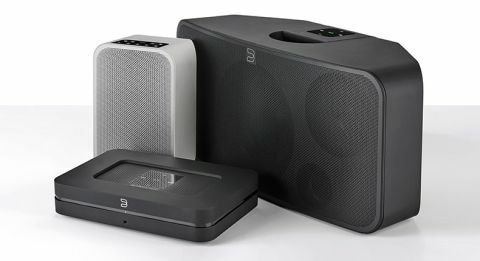 Bluesound counters with a substantial range of products from which to build your system. Though we weren’t able to hear it again for this update, the Powernode 2 (£800) – which adds amplification to the Node 2’s streaming capabilities – is one of our favourite Bluesound components, while the Vault 2 has a 2TB hard drive to store all of your music and a CD drive for easy and lossless ripping. The Pulse Soundbar and Pulse Sub also make Bluesound a full home entertainment system beyond only music streaming. The breadth of the range and the hi-res support remain key reasons to choose Bluesound over its rivals - but Audio Pro’s shaking up of the multi-room arena means it’s now the go-to for pound-for-pound audio quality, while the best user experience belongs to Sonos. Meanwhile, Denon’s HEOS system has an even greater selection of products to choose from. Between them, those rivals have crowded Bluesound out, and the result is a lost star for the system as a whole. If you’re already on board with Bluesound, fear not: your components don't suddenly sound worse, and it makes perfect sense to continue adding to your system - particularly with Pulse 2. What’s more, with a refresh to some specific components and one or two updates to the app, Bluesound could well force its way back to the top.